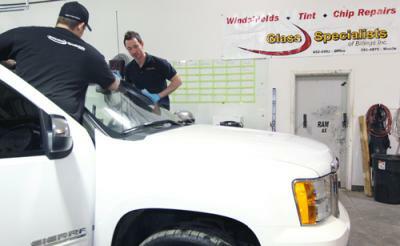 A chip in a windshield is almost always filled with a resin that looks and feels just like glass. Using specialty tools that drill small holes into the damaged glass and suction the air out to create a miniature vacuum on your car’s windshield, the resin is injected into strategic locations. The vacuum is used to remove any air pockets caused when the rock or other debris hit the windshield and opened it up to the elements. It also allows the stress on the glass to lower, meaning that the injection of the resin won’t cause much pressure that additional cracks will form. The resin is allowed to set for a period of time. This gives it the opportunity to change from a liquid to a solid adhesive, holding the glass together and giving the windshield back its maximum strength. This process is usually helped along by special tools that harden the resin faster, allowing you to get back on the road as soon as possible. The resin is usually polished as the final step in the process. Most of the resins used in windshield chip repair have the same properties as glass when it comes to interaction with light. The reason behind this is simple: when light hits the windshield, it is vital that there is no scattering or fracturing of the driver’s line of vision. In most cases, the windshield chip repair will only leave a small mark that indicates where the damage occurred, but without any lingering side effects that will impair the driver’s vision during day or nighttime driving. Restoring Your Vehicle’s Condition When done correctly, chip repair is a quick and easy process that doesn’t have to cost you much more than you normally spend on filling your car’s gas tank. Although your car’s windshield might never again look perfect, windshield chip repair will get you as close to perfection as possible.